If you are looking for a career with a world-class airline, youll find it aboard Jet Airways-Indias most preferred airline. Since inception 13 years ago, our services and features have always set new standards in the aviation industry. In fact, we've been recognised as Asia-Pacifics Best Domestic Airline by TTG Asia on four occasions. We've been honoured with the prestige Air Transport World Award by the leading aviation magazine ATW (USA). Over the years, we've also won numerous awards from our esteemed customers, the media and the trade. Everyday our young fleet of 58 aircraft flies to over 49 destinations across India, London, Singapore, Kuala Lumpur, Sri Lanka and Nepal. We have more than 330 daily flights. We connect a city within India every 5 minutes. In fact, every year over 13 million passengers choose to fly with Jet Airways. Now at Jet Airways, we were poised to expand our international operations. 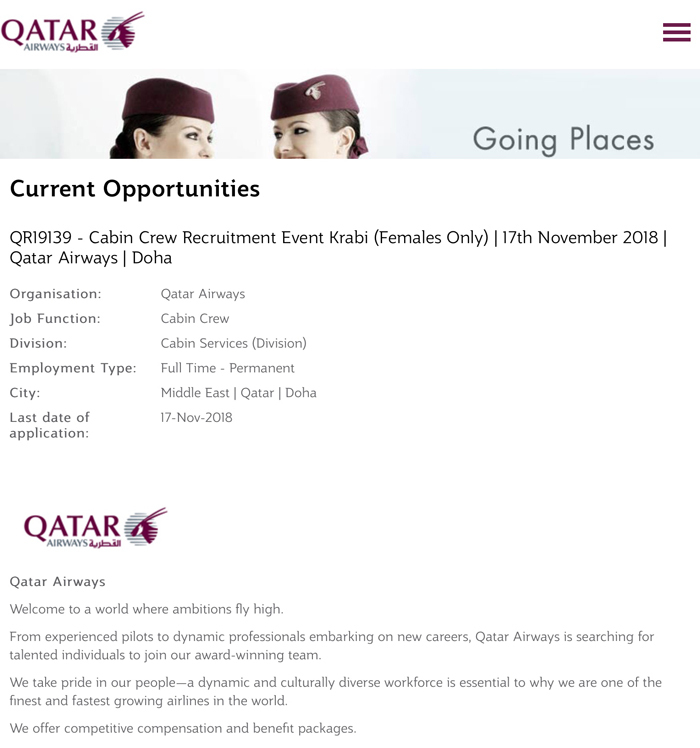 Which is why were looking for experienced, motivated Cabin Crew. 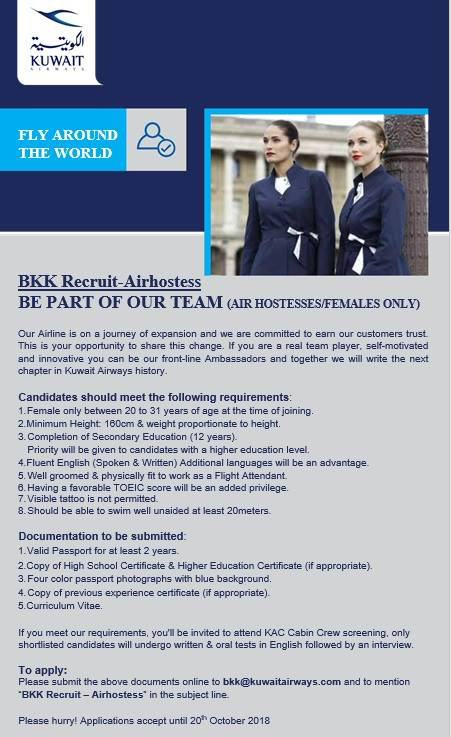 Come, be a part of our award-winning team. Attractive salaries commensurate with your level of experience will be offered. 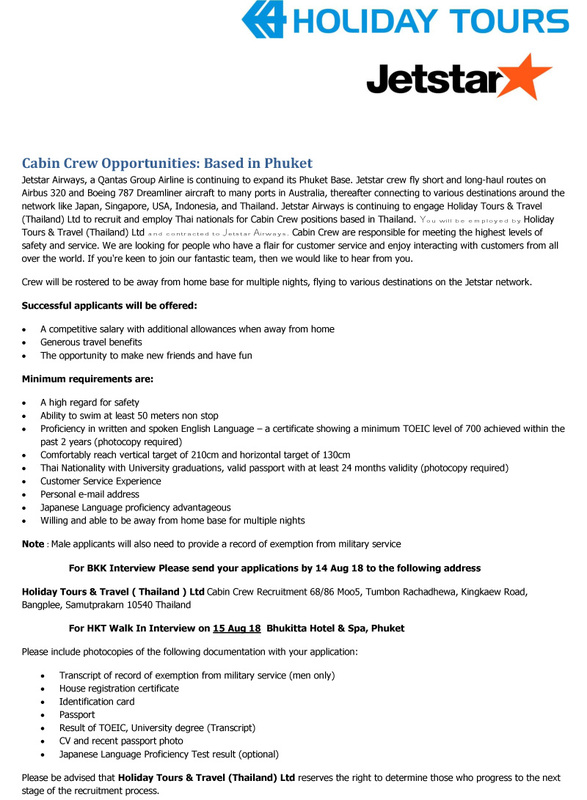 Crew will be based in Singapore. If you think you have it in you, apply within 7 days with a recent photograph to [email protected] and we will respond via email. Kenya Airways is truly the Pride of Africa. With a modern fleet of 34 air crafts, including Boeing 777s, our global network reaches 56 destinations in Africa and around the world. 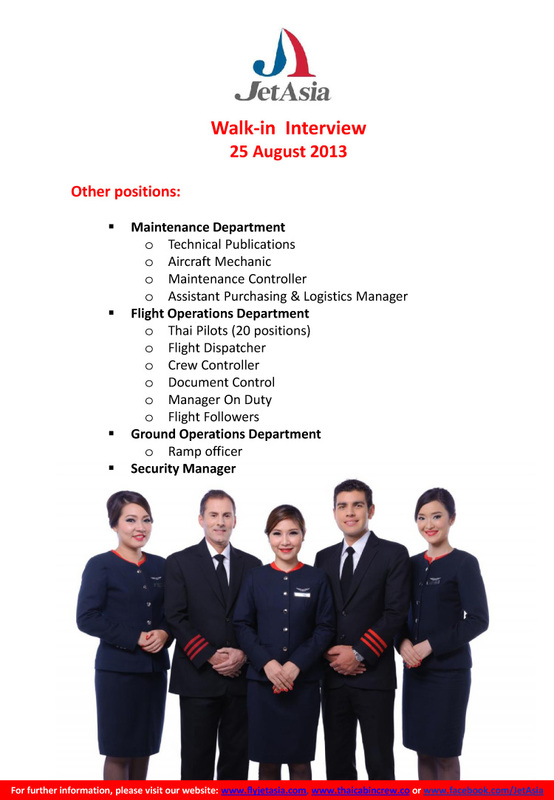 At Kenya Airways, we believe our greatest asset is our people. When you join Kenya Airways, we provide an environment that enables each and every one of our employees to achieve full potential. 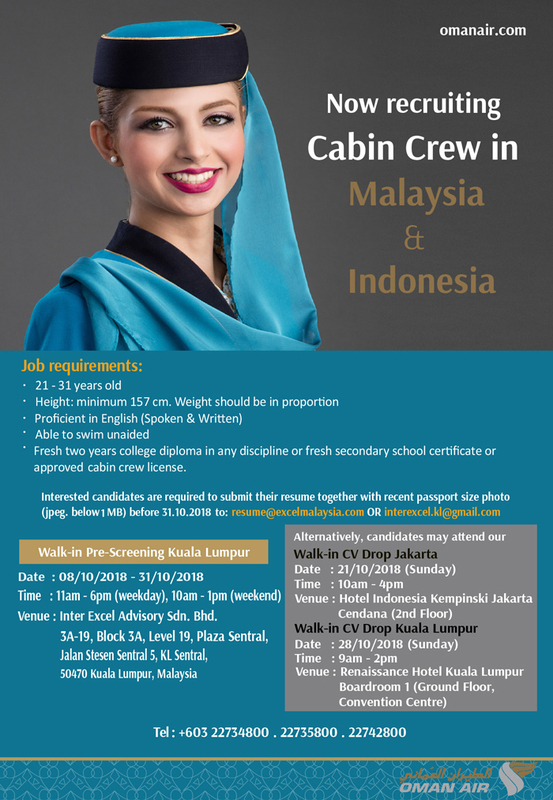 We are looking for dynamic and pleasant young men and women to join our team as CABIN CREW. All applications will be treated in strict confidentiality and only short listed candidates will be notified. 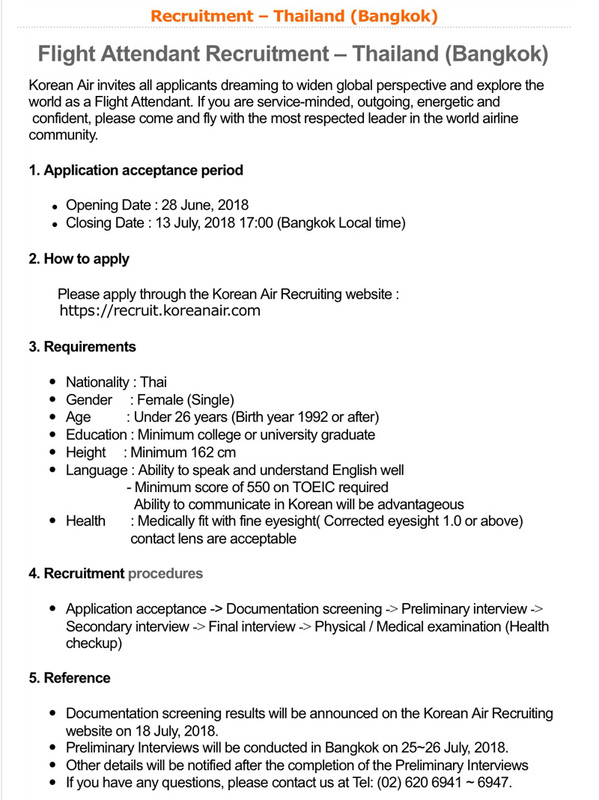 Qualified candidates can download the application at http://www.krabi-airline.com/career.html , walk-in to submit all related documents at Krabi airline Co., Ltd Central Block, Donmuang International Airport. -	The Company reserves the right to contact only those who fully submit all required documents and the cancellation could be applied at any times as the Companys consideration. -	Those who have passed as the successful candidates must be able to complete all the training and other curriculums. -	We ask that you do not contact the Company by telephone as we cannot provide any assistance. 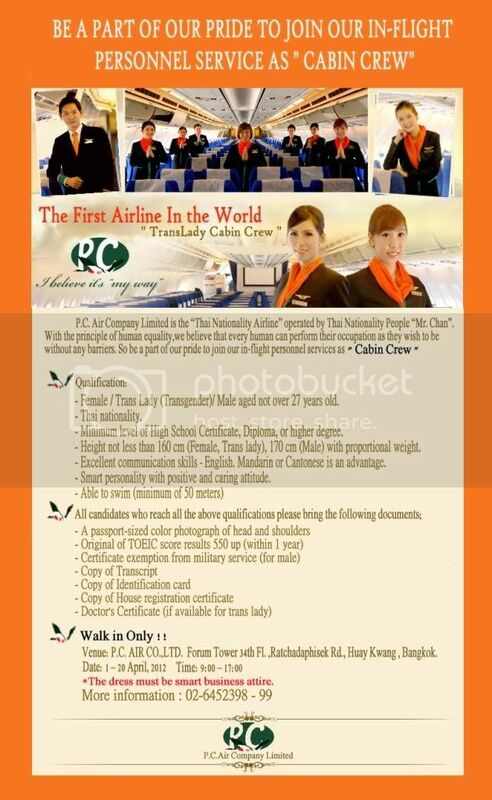 Lao Central Airlines : Lao Central Airlines,is the first Lao private airline. 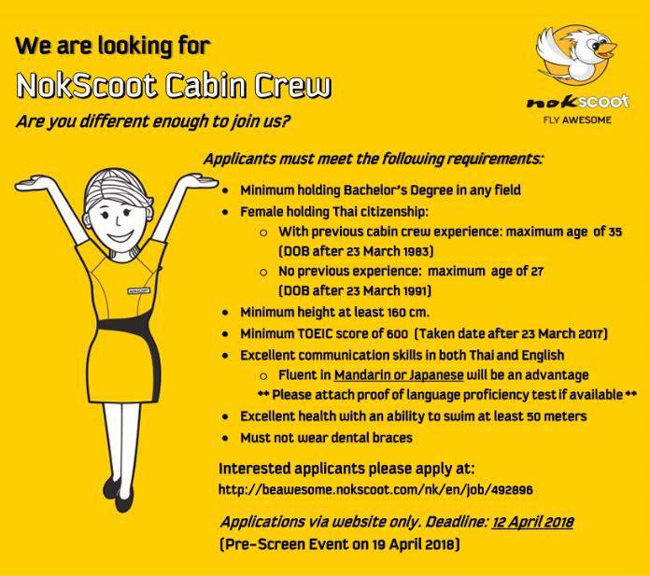 Job Description : Cabin crew will be responsible for ensuring the safety of our passengers as well as providing excellent customer service at all times. 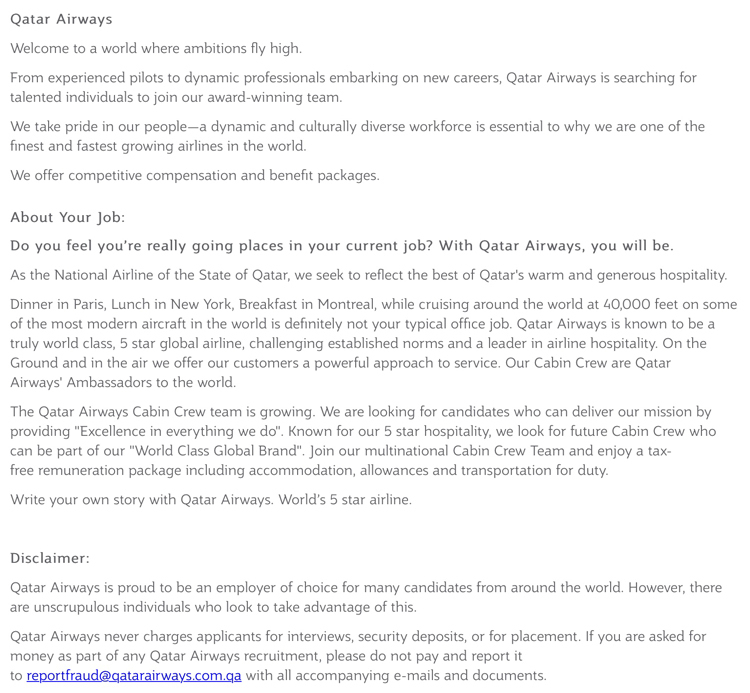 - Have a positive attitude, pleasant personality with ability to provide excellent service, working within a team environment. 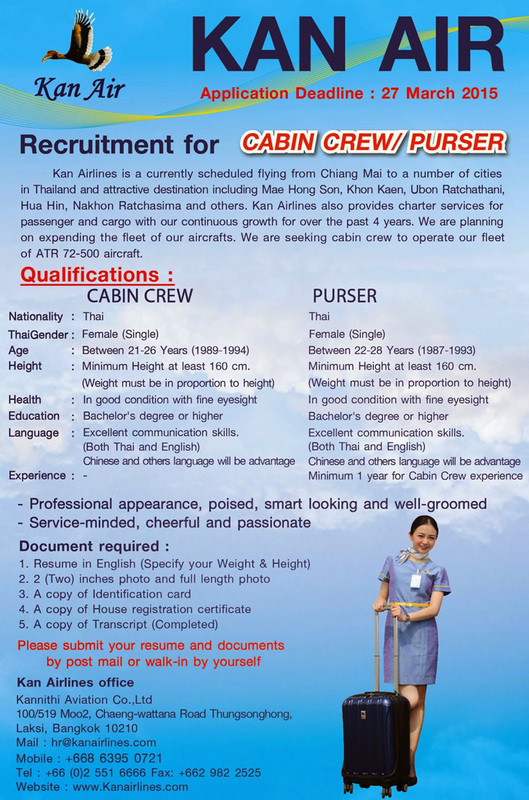 - Medically fit to meet cabin crew requirements. Unit 03, Souphanouvong Road, Ban Wattayyaithong Village, Sikhotthabong District, Vientiane Capital, Lao P.D.R. 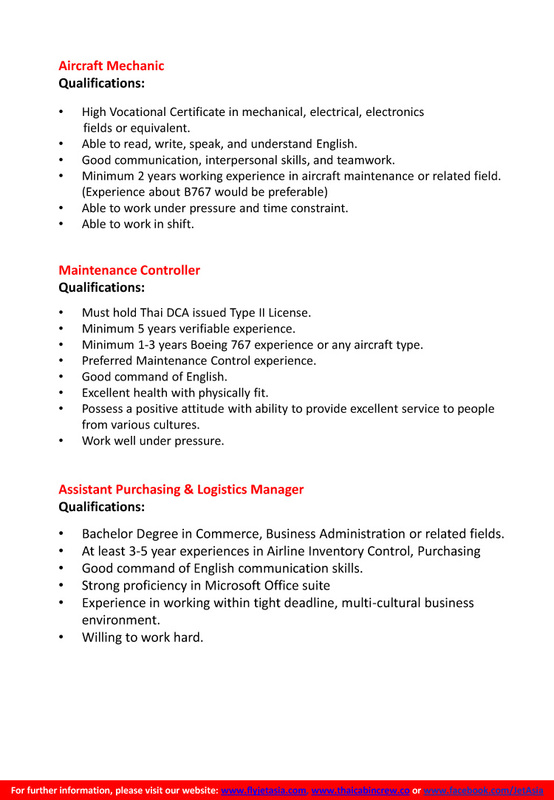 "We are currently hiring applicants fluent in Mandarin, German and Japanese Language"
• Preferred second languages are Chinese, Japanese, Russian, German and Korean. 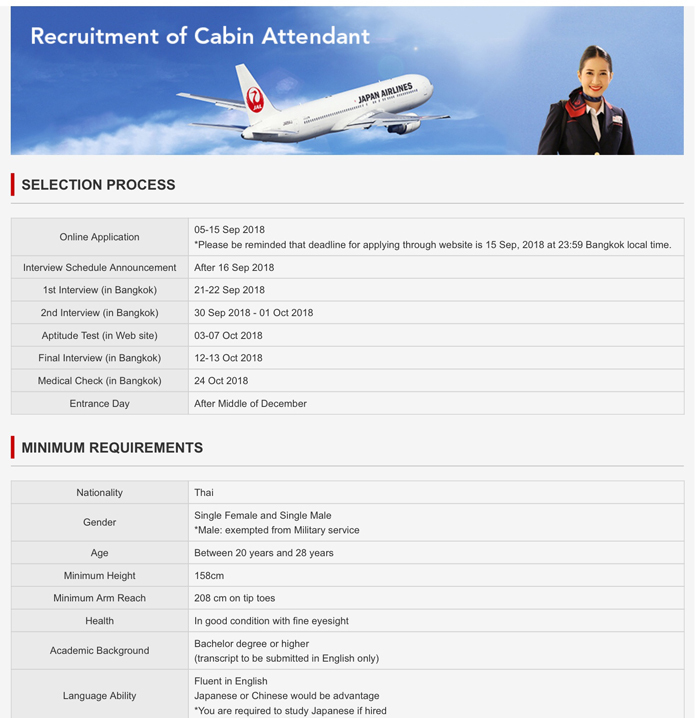 • Medically fit to discharge specified Cabin Crew duties. Age not over 33 years old for female / 34 years old for male. Holding Bachelor’s degree in any field. TOEIC level of 600 or above. Exam taken within last 2 years. Charismatic personality with positive and well groomed appearance. Excellent health and fitness condition. Able to swim 50 meters. 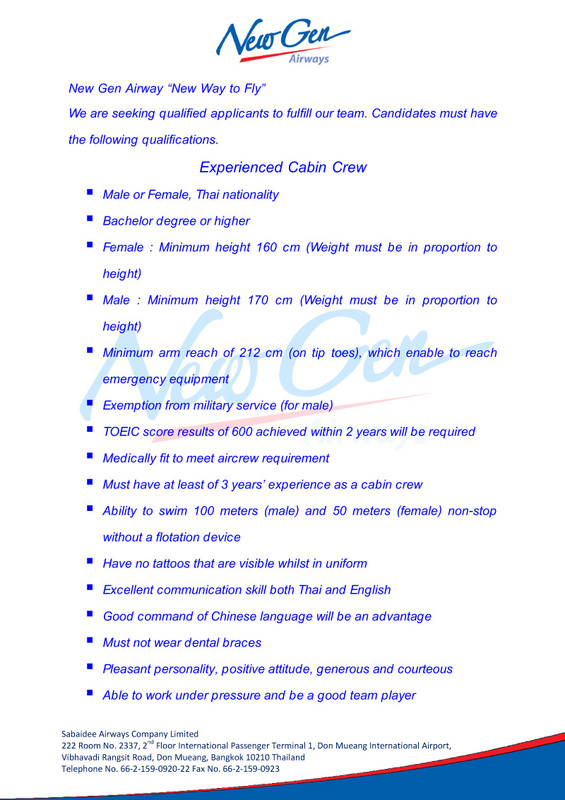 Resume in English (Specify your Weight and Height). A recent 2-inch photo and full length photo. A copy of identification card. A copy of House registration certificate. A copy of TOEIC score results of 600 up. A copy of Military Exempted documents for Male applicants. 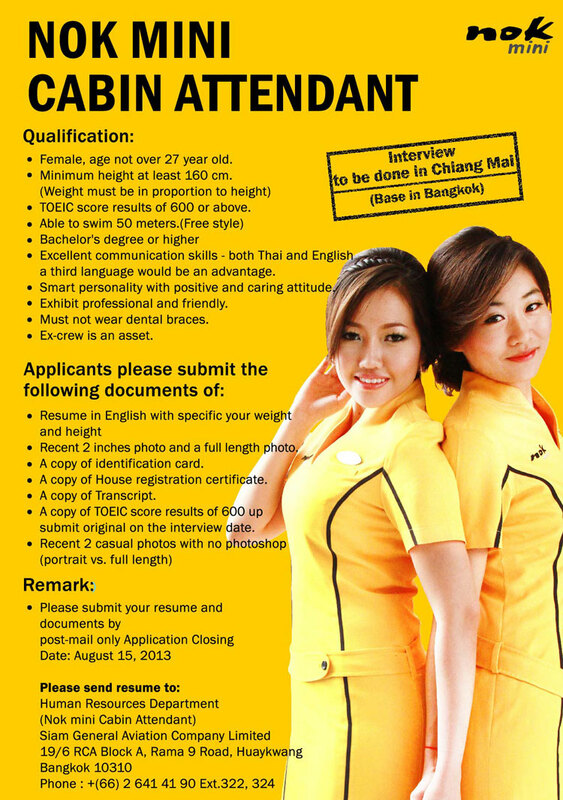 Please submit your resume and documents by post –mail to the address below. 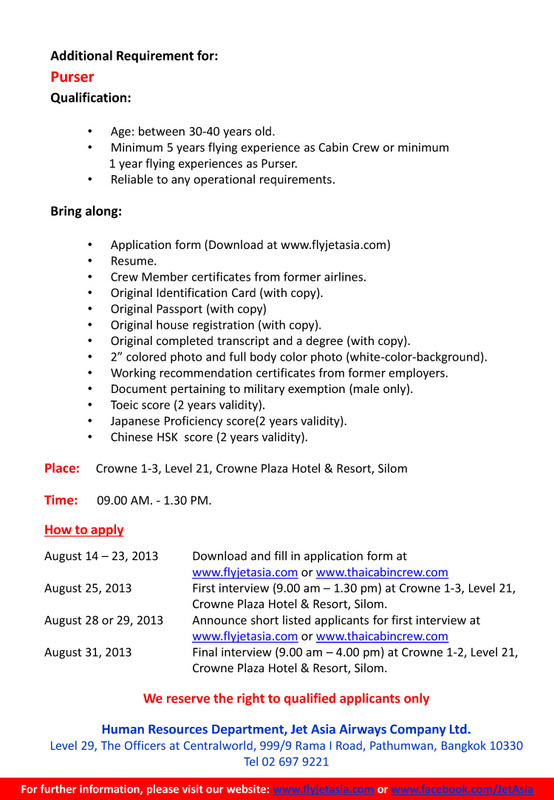 Nine Star Airways Co., Ltd. Registration from 08:30am until 11:30am. No candidates will be accepted after 11.30am. The assessment is scheduled to last till 5.00pm. 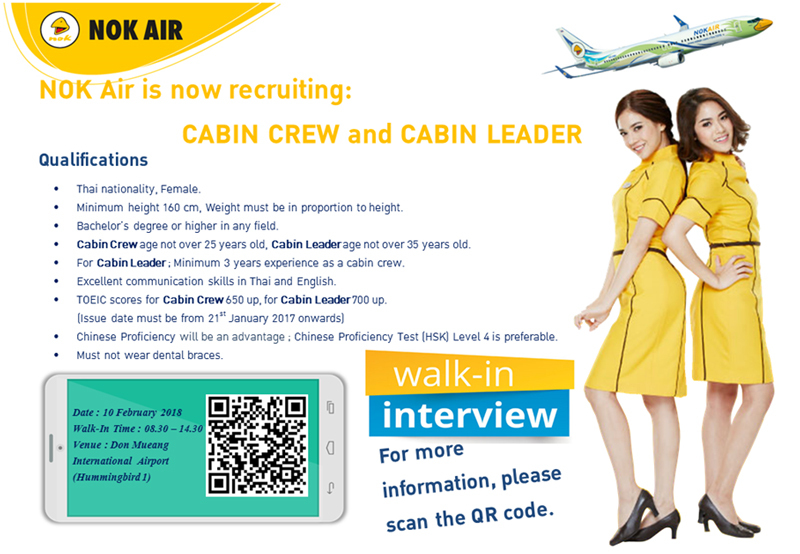 Oman Air offers you the chance to be ambassadors for a recognised leader in the aviation industry, with a reputation for integrity and excellence. 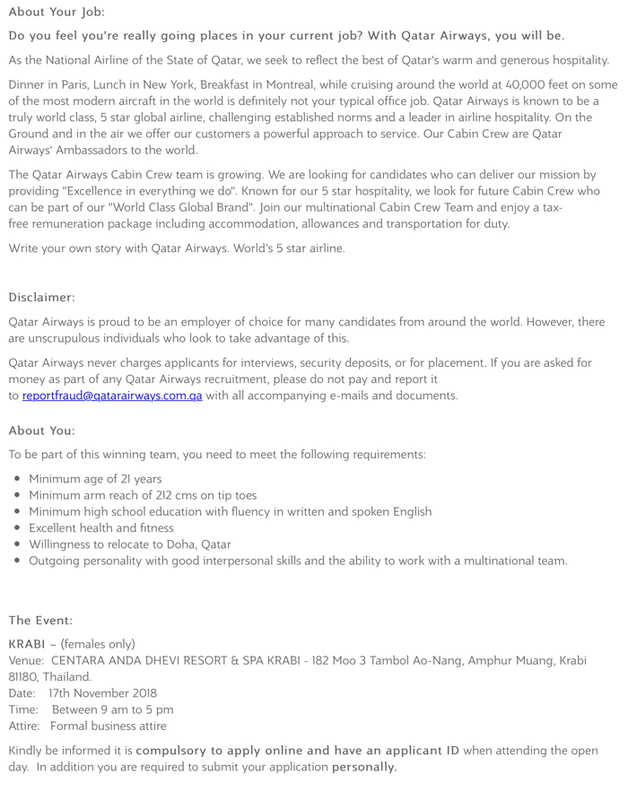 This position is based in Muscat, Oman. Oman Air offers a competitive tax-free salary with travel benefits on Oman Air and partner airlines. Fully furnished shared accommodation is included. 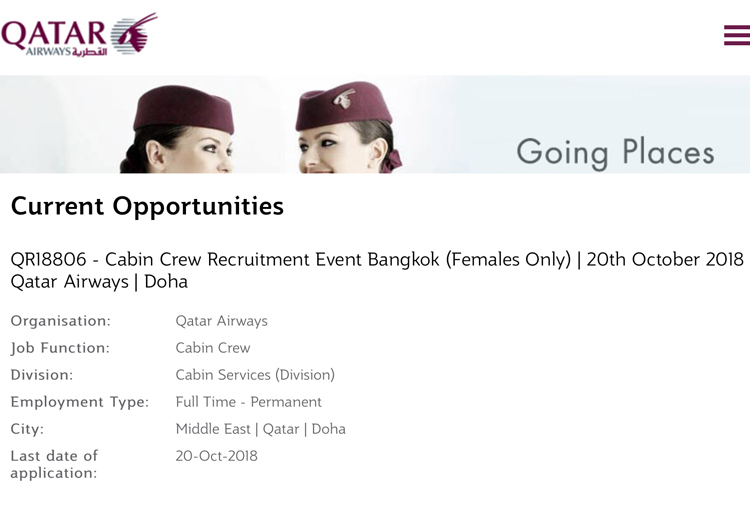 As part of the Oman Air Cabin Crew team, you will be responsible for ensuring the safety of our guests as well as providing exceptional customer service at all times. You should be able to demonstrate cultural awareness and the ability to adapt to new environments and people. 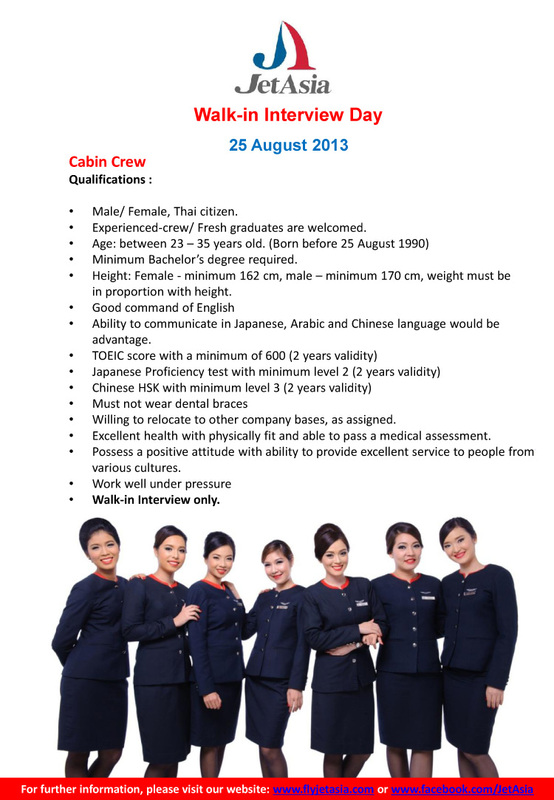 Orient Thai Airlines, we are looking for FLIGHT ATTENDANT to be part of our team. • Have height and weight proportionate to maintain professional appearance. you may wish to inform them of the details below. 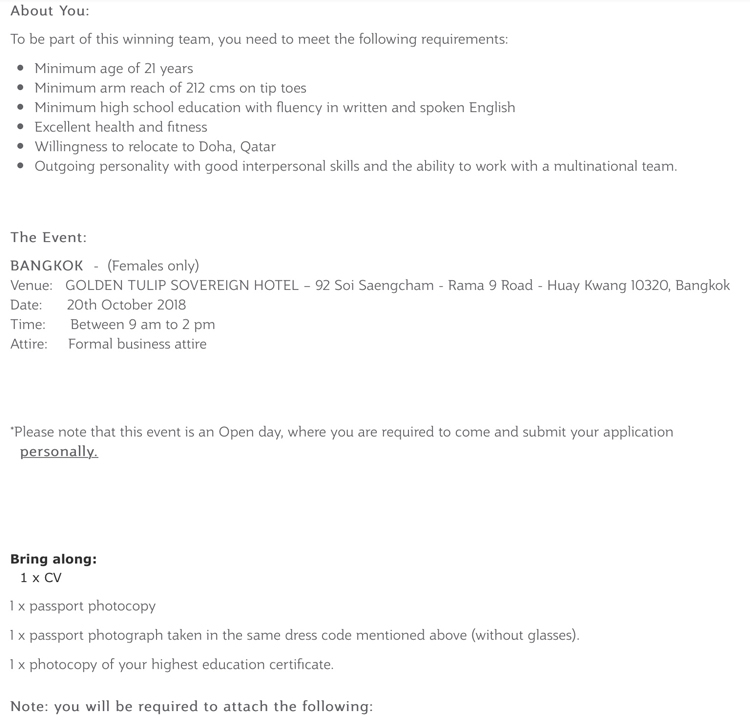 Please bring your CV in English personally along with full length and passport size photographs. 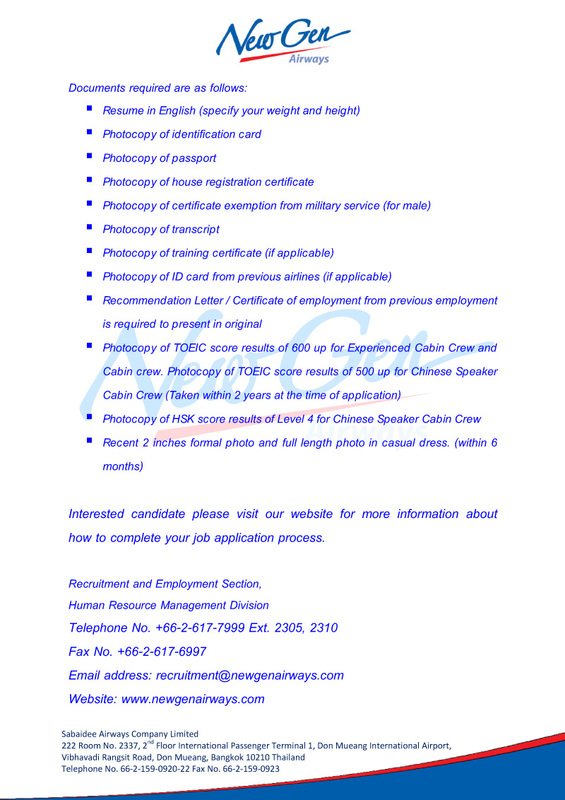 A copy of the Identification card, valid international passport, transcript of record, document pertaining to military exemption (male only), the original TOEIC result. Short listed candidates will be required to attend further processes over the next two or three hours. - Female / Trans Lady (Transgender)/ Male aged not over 27 years old. 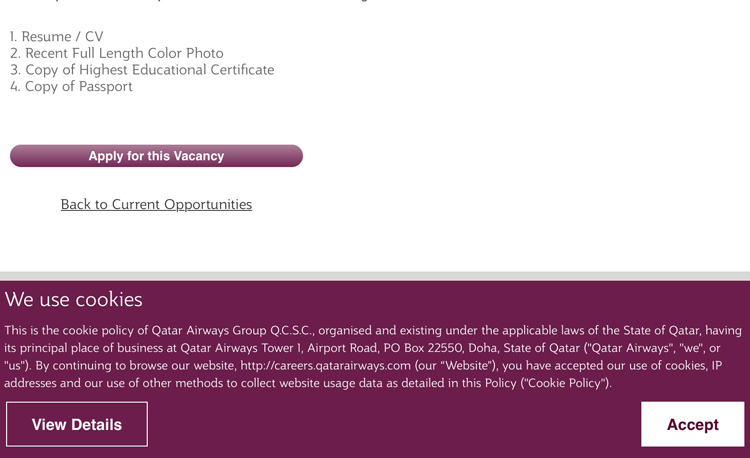 - Minimum level of High School Certificate, Diploma, or higher degree. - Height not less than 160 cm (Female, Trans lady), 170 cm (Male) with proportional weight. 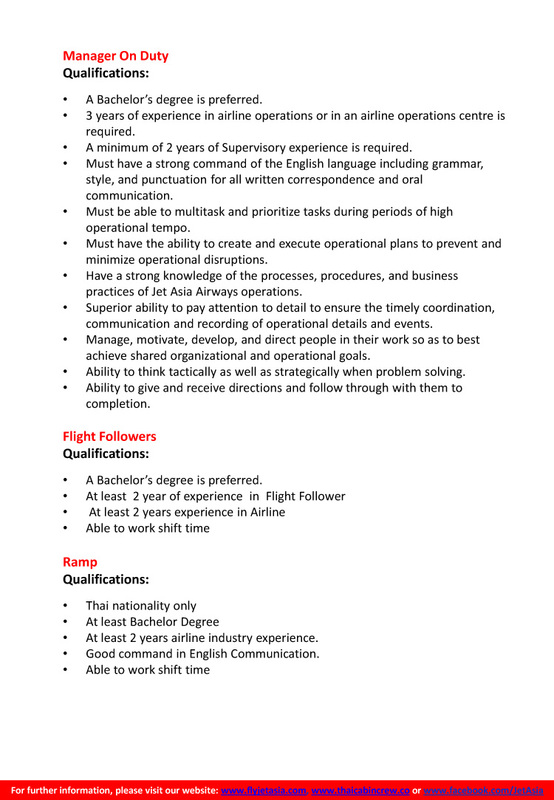 - Excellent communication skills – English. Mandarin or Cantonese is an advantage. - Smart personality with positive and caring attitude. Venue: P.C. AIR CO.,LTD. Forum Tower 34th Fl. ,Ratchadaphisek Rd., Huay Kwang , Bangkok. 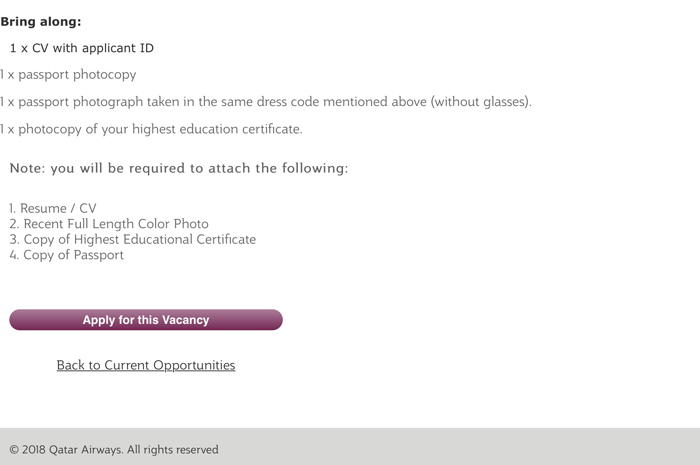 *The dress must be smart business attire. - Minimum 5-3 (1.60 meters) ความสูงขั้นต่ำ 160 ซม. 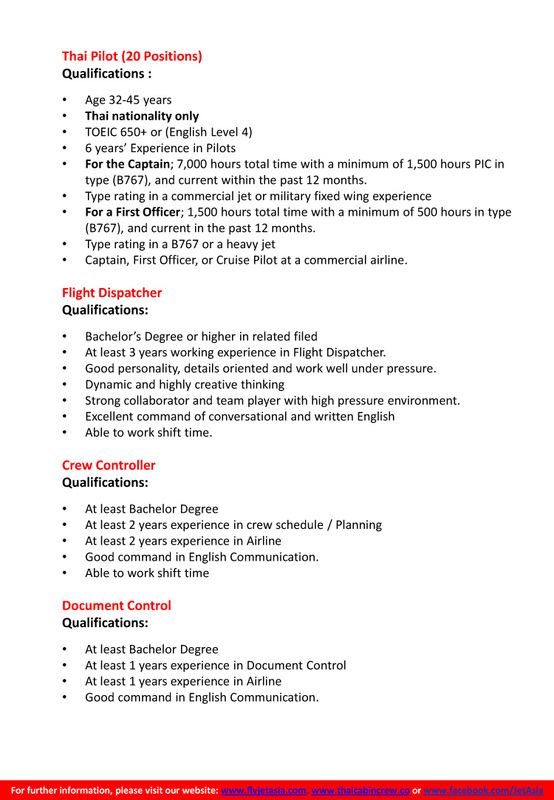 Mailing address : Platinum Airways Co., Ltd.
เรา : Hello, How r you? กรรมการ: I’m good. thank you. How’s about you? เรา: I’m good, thank you. กรรมการ: What are you doing right now? พอตาเราเข้าห้องไปเราก็ทักกรรมการก่อนเลยค่ะ Hello, How r you. We know that your time is precious so why not save some and apply online! If you are shortlisted we will be in touch with your personal invite to the event. วันที่ 17 พย.นี้ ตั้งแต่เวลา 0900-1700 น. •	Minimum height 160 cm. Potential earnings of up to B$1000 per month. 30 calendar days of annual leave. Free Brunei based accommodation and free transportation on duty. Free travel to any RBAs destination once a year and discounted travel at other times upon completion of probationary period. A professional training package and career promotion opportunities. 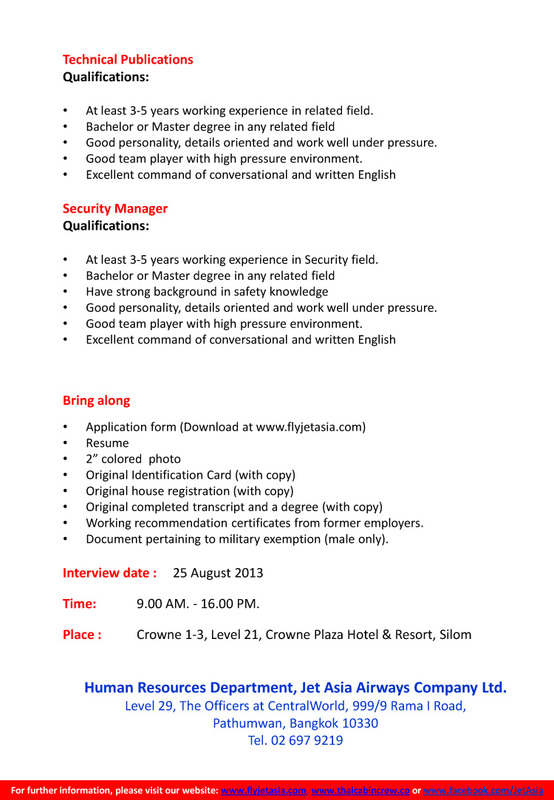 Note: Only short listed applicants will be notified and invited for interview. Incomplete applications will not be entertained. - High school certificate or equivalent as a minimum requirement.